Give a life-changing gift for Christmas. This Christmas, join us in giving hope through education. Here’s how it works. Look through our Gift Catalog items below. Pick a gift in honor of your loved ones. Select Add to Cart and make your donation via PayPal. Then send your loved one a special Christmas card from Impact One to tell them about the gift in their honor. If you’d like to spread the joy through many gifts, you can select continue shopping on the PayPal screen to add more items to your shopping cart. You may also choose to give your own amount at the bottom of the page. Impact One will use your generous donations to continue impacting students and teachers in our community. Help us stock our Resource Room in the new Library with supplies that our teachers can take and use in their classrooms. Once the children have finished learning that topic, the teachers return the resources back to the Library so that another school can benefit from them. Maximizing impact with all of our resources, each item will be used in several classrooms with hundreds of children! Early childhood development is the foundation all of our kids need. And learning through play is an essential component. Help us buy building blocks, shapes, stuffed animals, and more to develop the youngest minds. We are helping our teachers develop effective methods that involve more than just “chalk and talk.” Help us to buy math, science, and literacy resources for teachers to use in their classrooms to make learning interactive and memorable. Our schools rarely have a complete set of textbooks to use when planning lessons. 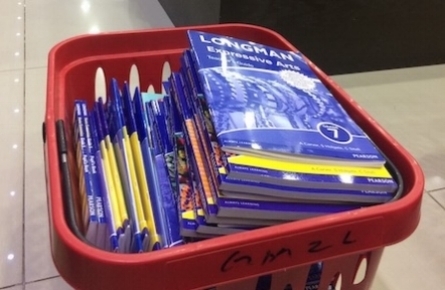 Our goal is to have at least one copy of every subject and every grade in our Resource Room for teachers to borrow and deliver high-quality lessons. Students from our partner schools and from the community come to visit our Library each week where they read, write, and do fun activities. Help us get the supplies we need to have lots of fun in the Library! Our kids love puzzles! And for many of them, they had never seen one until our Library opened. We love watching their brains develop as they learn to manipulate and match the pieces. While we have a few puzzles already, the kids use them so much that they wear out quickly. Help us create a larger inventory of puzzles. One of the goals of our new Library is to provide opportunities for kids to express themselves through art. Our kids are filled with talent, but have few chances to let it shine. Help us buy art supplies like paint, crayons, sidewalk chalk, and all the crafty things so that our kids can explore new ways of expressing themselves. Along with visual art, we want our kids to have opportunities to develop their musical talents as well. At this point, we have no musical instruments in our Library (see air instruments in picture above). Help us buy recorders, keyboards, drums, and more to engage our young musicians. The primary focus of our work is to train and mentor teachers and school leaders. Help us provide these services to our 9 partner schools so that they can deliver quality education to thousands of vulnerable children. Through group trainings, our teachers and school leaders learn many skills. From how to teach reading to how to create a budget to how to use a computer, each skill helps them become a better teacher who can invest in their students. Help send one teacher to a 5 day training with us. 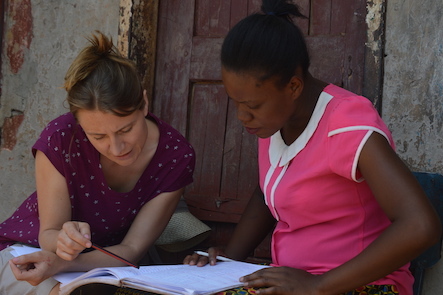 After our group trainings, we provide follow up mentoring for our teachers where we go into their classrooms or offices and help them refine their skills. The mentoring is key to helping them become masters of the new skill. Help us give one teacher mentoring services for one month. Our grant program allows schools to apply to Impact One to receive funds to help them buy much needed resources, like computers, desks, books, and even build classrooms. We are intentional about providing strategic support to build their quality and sustainability. Help us give one school a grant next year. Not sure which gift to choose? Give an amount of your choice to Impact One’s programs and we will use it to meet our greatest need. Your donation will allow us to continue partnering with 9 schools to provide training, mentoring, and networking opportunities to improve their quality of education. It will ultimately impact the future of thousands of children. All of the items in our Gift Catalog are needs on our current organizational plans and we hope to fulfill them in 2019. However, please note your donation may not be used for the specific item chosen, but will go to our greatest need at the time.